Rogers has finally opened pre-orders for the Sony Ericsson Xperia X10 handset. The X10 is available in both black and white and is available for $150 on a three-year plan. With every preorder with a three year voice and data plan, customers also get a free Bluetooth headset and a chance to win two tickets to the FIFA World Cup. More info on the X10 launch will be coming soon. Stay tuned. That free Bluetooth stereo headset mentioned above is the MW600, certainly a nice bonus that has featured in some retail boxes in other regions. 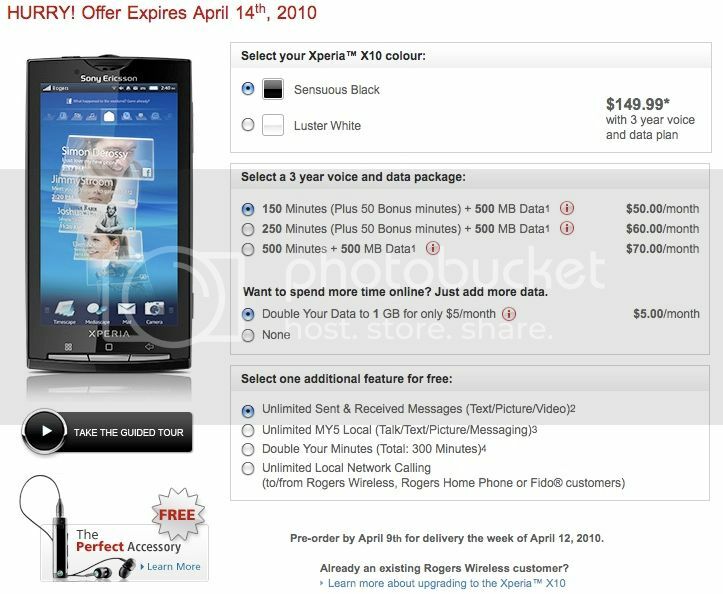 Rogers states that “Pre-order by April 9th for delivery the week of April 12, 2010″. The pre-order deal expires on April 14th as the device is officially launching April 15th. Click through for a screencap of the pre-order page. Got an email today telling me the Xperia X10 is on its way to me. Btw, I hear there is a recent update available that greatly enhances the audio quality. Whoa, if the Canada version is nearing, shouldn’t the US version come not far from it? Or can the canadian run US 3G too? yea there is an update availible somewhere in asia…and adam, the Rogers 3g is the same as ATT 3g so it will work on both if you unlock your phone.